Happy Birthday to my good blogging (soon to be real-life) friend, Bev from Gotta Do the Happy Dance! Hannelie contacted a bunch of us in advance to co-ordinate a birthday blog surprise for Bev, but you are all invited to join in the birthday fun! 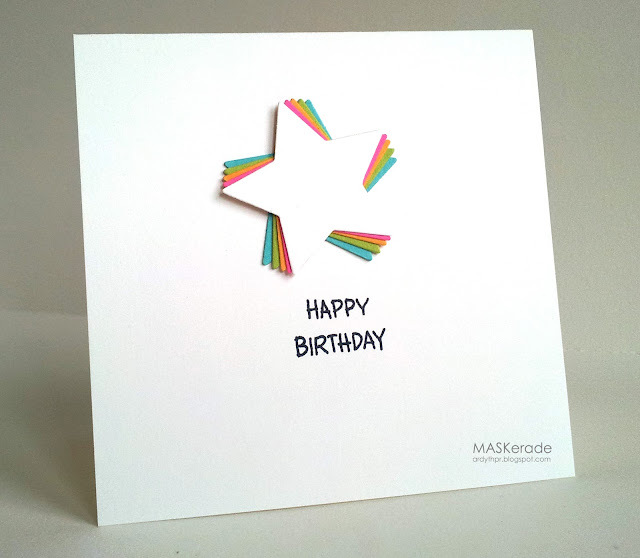 Bev is a very talented cardmaker, but more than that, she is a sweet person who is always positive and who always has a kind word of support for so many of us in this blogging community. For this card, I used a nestability to cut 5 stars and then I glued them together, just slightly offset, so that you can see them all. And I'm so excited that in less than a month, I will be able to deliver this to Bev IN PERSON when I go to Wisconsin for my annual trip to visit my sister. I just can't wait to have some time to chatter away with Bev and for us to really get to know each other. I know from my visit last month with Virginia and Tracey that blogging friends (just like the cards we make) are even better in real life! It would be a dream come true to meet my blog buddies who live far far away! Thanks for joining the fun Ardyth with this very special card. I ♥ it! Oh how awesome that you will get to meet Bev! I love how you slightly tilted the stars to create fabulous dimension. Swoon! I LOVE this!!!! Serious awesomeness. :) And whoop whoop for meeting bloggie buddies! What an awesome card!! Love the crisp CAS style! Perfect colors for Bev's card...bright, happy, and as Anita said, starry perfection! Wow! Awesome job lining up the stars! Perfect, perfect, perfect--need to CASE you! Ardyth - this is really AWESOME!! especially when you need a quick card - CASing you for sure!!! PS, wished I lived close by - nothing beats meeting your SCS friends!! That's terrific that you'll be able to meet Bev in person. Your card is FANTASTIC Ardyth!!! Perfectly fanned out stars . . . love them! I'm sure she will just adore it! Oh, I just love this one ~ an idea I will definitely be CASEing! Oh Ardyth, this is fabulous! I'm sure Bev will LOVE it! That colorful star is such a neat idea. I'm so jealous that you get to meet your blogging friends IRL. I hope you reserve plenty of time for all the chatter and have a terrific time. SUCH a brilliant card, and right in the nick of time for me because my mojo has been AWOL for months and I have way too many birthdays to gift in October. I can do this star right tonight! Thank you, thank you, thank you. I'm so jealous, wanna meet you and Bev in Wisconsin, or anywhere else, for that matter. I do hope you both have perfect weather and a fabulous time. Totally innovative and striking design. And I'm envious of your soon-to-be get together. How wonderful that you will get to meet sweet Bev,in person. Beautiful card! I have many reliable in WI both if my parents are from there.